Environmental Psychology at The Graduate Center » Brown Bag with Dr. Silvia Mazzula! 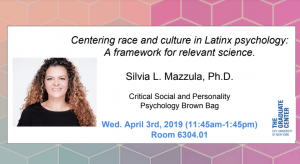 Centering race and culture in Latinx Psychology: A framework for relevant science. March 27th, 2019 (11:45am – 1:45pm). Room 6304.01. Silvia Lorena Mazzula, Ph.D., is an award-winning educator, scholar, and mental health researcher who focuses racial cultural trauma and stress, social networks and academic pipeline development, and Latinx psychology. A tenured associate professor of psychology at John Jay College of Criminal Justice and former President of the Latino Mental Health Association of New Jersey, Dr. Mazzula is an authority voice on support for Ph.D. prepared Latinas and nationally recognized for her successful outreach to underrepresented scholars, students and faculty members. She is a founder and Executive director of the Latina Researchers Network (LRN): the country’s first multi-disciplinary research network to support Latina doctoral level investigators, professors, scholars and evaluators, where she manages program design, incubation, and evaluation.Under her leadership, LRN has grown to 3,000+ worldwidesince its inception in 2012. Dr. Mazzula’s work has been published in scientific journals and book chapters. She is an editor of SAGE Encyclopedia on Psychology and Gender, author of Ethics for Counselors: Integrating Counseling and Psychology Standards, and co-investigator of the Race Based Traumatic Stress Symptom Scale. She has given 100+ empirically-based talks, seminars, and workshops on culturally responsive science and on diversity, equity and inclusion throughout the country. She has earned numerous grant awards, appeared on NBC, and featured or expert quoted on National Public Radio (NPR), USAToday, Washington Times, El Diario NY, Insight into Diversity Magazine, and others. In 2018, she was recognized as one of 25 North American women psychologists for the American Psychological Association’s exhibit “Firsts: Women of Color Changemakers”. A Columbia University alum, Dr. Mazzula is an Afro-descendent Latina, first-generation college graduate from poor economic background, born in Uruguay, South America, raised in New Jersey, and mother of three boys.